2012 Books Read, Book Reviews, Rating: 4 Stars :D, Ready, Set, Readathon! So I have two options. One, remove my reading glasses every time I need to wipe the tears from my eyes; or two, hold the book far enough away so I can read without my glasses and wipe my eyes as I read. I choose the latter, since the third option (stop reading altogether) isn’t really an option at all. If you read Young Adult-type books I am sure you have heard of this book. It’s been everywhere, including the number one spot on the New York Times Bestseller List. There’s nothing I can say about it that hasn’t already been said. But since I’m here, writing, and since you’re there, reading, what the heck. Hazel, 16, meets Augustus,17, in a cancer support group for kids. He’s only there to support his friend, Isaac, who has lost an eye to cancer. Hazel wasn’t supposed to be there, meaning, she wasn’t supposed to make it this far. Three years into her battle, she’s holding steady. Despite her ruined lungs, traveling oxygen tank, hovering parents and lack of a life of a normal teenager, she’s one of the “lucky” ones. Augustus knows exactly how she’s feeling, since he, too, is a lucky one, except for the missing leg. But he’s been clear for a while, and gives Hazel a focus that she desperately needs. He’s been there, yet he refuses to stay there. For you can’t be “normal” ever again. People either keep you at an arm’s length because they can’t relate or they pity you. Neither are comfortable places to be. I’m a grenade and at some point I’m going to blow up and I would like to minimize the casualties, okay?”…“I’m a grenade,” I said again. “I just want to stay away from people and read books and think and be with you guys because there’s nothing I can do about hurting you; you’re too invested, so just please let me do that, okay? I’m not depressed. I don’t need to get out more. And I can’t be a regular teenager, because I am a grenade. Augustus lives his life like there’s literally no tomorrow. Even though his type of cancer has an 85% rate of recovery, he’s prepared for death since his first diagnosis. He has the suit, he’s chosen his plot. So all that’s left to do is go to school and be the center of the universe for his friends. His sense of humor, his unflinching views and his love for Hazel are what keeps everyone going. How many cancer survivors do you know that like to taunt death by dangling an unlit cigarette between their teeth or help their blind friend egg an ex-girlfriend’s car? How many would share their “wish” with a girlfriend who has already used hers to travel to Disney World (“Hazel GRACE!” He shouted. “You did not use your one dying Wish to go to Disney World with your parents!”)? This book, in all of its scary cancer-ness and talk of treatments, lost body parts, lost children, and lost control is ultimately about moving on. From cancer itself, whether through death or remission. From illness being the central focus of one’s life (or entire family’s life). From friends, both former and stricken. It’s about people telling you that it’s okay that you’re a grenade and they would rather feel the unholy force of your explosion than never feel your love or touch or presence. Because, ultimately, people will be people, we should allow them to be so, and we should let in those who think they can handle an untimely end and love those who can’t. It is still a tragedy, especially my looking through a lens of advanced adulthood, knowing the life that they’ll miss. But while they are alive, let them carve their niche in their own way and savor life and its “normal” ups and downs the best they can. Otherwise, it’s pretty hypocritical. For how can you justify feeling pity or remorse for someone because they can’t live their life and then you don’t let them try? But in ourselves, that we are the underlings. 4.5 of 5 Stars (Based on Ink and Page’s Rating System) and 27 tissues. 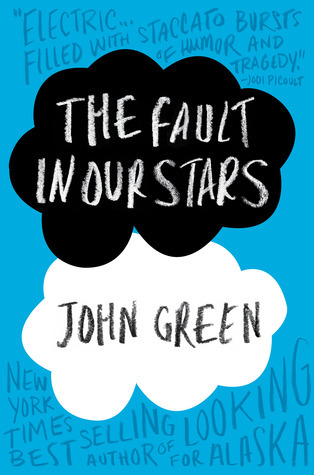 The Fault in Our Stars by John Green was published January 10, 2012 by Dutton Juvenile. Ha! I never thought about that! This was a real, honest-to-goodness book I was reading this time. But I do use my Nook a lot…next time!